The other night I decided to make 3 completely new recipes, ones I had found in some internet searching but never tried. It was a three-course dinner the other night with recipes from three different places – an appetizer from a fellow blogger, the entree if a mere 4 points from Weight Watchers (and worth each delicious point) and the dessert, from Miss Giada di Laurentis herself. I must say though, of the three, I was the most disappointed in Giada’s recipe. I wish I had taken pictures, but I forgot, of course. More details about this in a bit. 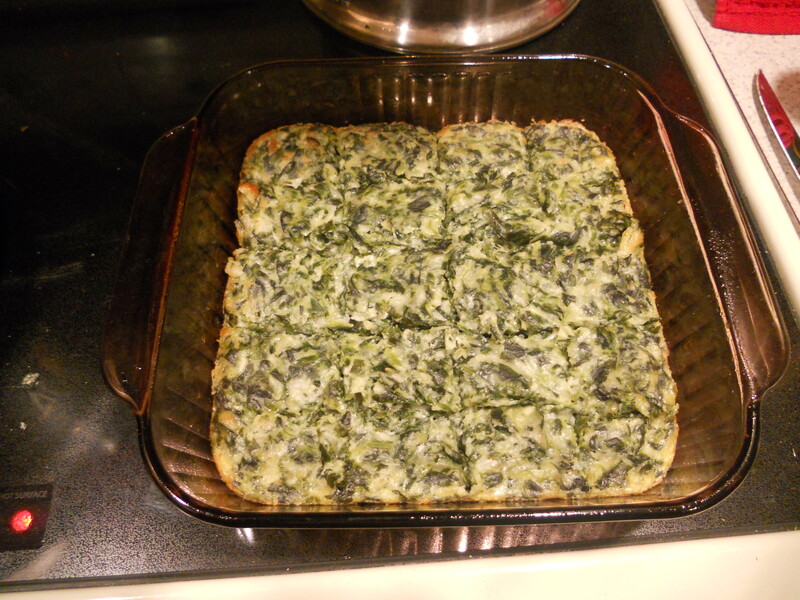 I decided to make “Spinach Brownies” as the appetizer for a few reasons. One, they are from a blogger whose website I visit frequently. Jamie, the lovely young lady who writes My Baking Addiction is, to me, a culinary genius. (Not to mention one of the most creative cupcake makers I’ve come across.) I know the name seems a little off-putting but don’t be fooled – these things are incredible. I decided to make them because even though my original appetizer recipe for spinach balls was a hit with my family, this recipe is much less time consuming (and definitely more delicious). I made a few changes – her original recipe calls for bell peppers and bacon, but I think they were just as yummy. 1. Preheat oven to 375 degrees F (190 degrees C). Lightly grease a 8×8 inch baking dish. 2. Place spinach in a medium saucepan with enough water to cover. Bring to a boil. Lower heat to simmer and cook until spinach cooked, about 5 minutes. Remove from heat, drain thoroughly and set aside. 3. Sautee onions and garlic in a pan over medium heat until vegetables are slightly softened. 4. In a large bowl, mix flour, salt and baking powder. Stir in egg, milk and butter. Mix in spinach, onion mixture and mozzarella cheese. 5. Transfer the mixture to the prepared baking dish. Bake in the preheated oven 30 to 35 minutes, or until a toothpick inserted in the center comes out clean. Cool before serving. Next up, the entree. While browsing my account on Weight Watchers, I was looking up healthy dinner recipes featuring ground turkey for the sole reason that I had some in my freezer and I’ve been dying to experiment with it. Plus, I had to find some way to “hide” it well enough in flavor that my dad (who prefers fatty ground beef, obviously) would love it. When I found this recipe, a mere 4 points a serving, I knew it was the one. Preheat oven to 350ºF. Halve squash lengthwise; scoop out seeds. Place squash, cut sides down, in a large baking dish and prick skin all over with a fork. Bake until tender, about 30 to 40 minutes. Meanwhile, cook turkey, stirring occasionally, in a nonstick skillet over medium-high heat until browned, about 5 minutes. Drain, remove from skillet and set aside. In a same skillet, heat oil over medium-high heat. Add onion and garlic; saute until onion is tender, about 5 minutes. Stir in tomatoes and Italian seasoning; bring to a boil. Reduce heat; add cooked turkey and simmer, stirring often, until desired consistency, about 5 minutes. Coat a 9-inch glass pie plate with cooking spray. Remove squash from oven and increase oven temperature to 375ºF. LET COOL OR YOU WILL BURN YOURSELF. Using a fork, carefully rake stringy squash pulp from shell, separating it into strands that look like spaghetti. Arrange spaghetti squash strands in bottom and up sides of pie plate to form a crust. Add ricotta cheese mixture and gently spread over squash. Pour tomato-turkey sauce over cheese mixture and sprinkle with mozzarella. Bake for 20 minutes. Remove from oven and let stand 5 minutes before slicing into 6 pieces. Yields 1 piece per serving. And of course, my favorite part of any meal – dessert. More specifically, Giada’s Lemon-Ricotta cookies. Originally, I made these for a colleague at work because she requested them a while ago. I made a half batch because really, who needs 45 cookies? Overall, my three course experiment was very successful. Next up? Christmas – let the Season of Joy & Sweet Treats begin! Next Not your average beef stew..